What is a hot & Cold Stone Massage? 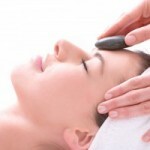 Receiving a hot and cold stone massage can bring the benefits and pleasures of combining both. The combination of the hot and cold stones are extremely relaxing and clients often can’t tell the difference between the hot and cold when performed by a skilled therapist. 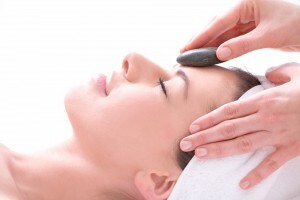 Massaging and alternating the hot and cold stones helps every cell in the body to receive more oxygen and nutrients and moves lymph thereby encouraging a more effective removal of toxins. Blood vessels will rise to the surface and dilate when the hot stone is applied and then vessels will constrict and move blood back to the inner core muscles when cold is applied. The opening and closing of the blood vessels causes a pumping action within the circulatory system which brings in more blood to the lungs and heart. It’s pretty much a vascular gymnastics for the body. It allows the body to achieve the same level of relaxation and rejuvenation as going to a sauna and jumping in the plunge pool but with the benefit of a massage included. 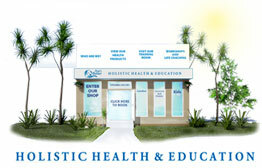 Cold therapy, is now often known as cryotherapy and it works on the principal of heat exchange. This occurs when a cooler object is placed in direct contact with an object of warmer temperature. The cooler object will absorb the heat of the warmer object in an attempt to achieve balance. Many sports therapists/physio’s are utilizing the power of cold stones/tools to assist them in their treatments and many just use cold stones throughout the treatment without using hot stones at all. Aids in reducing swelling and treating work, sporting and other accidents by helping to release blood in the affected area. Peripheral vascular constriction. (Restricts the blood supply to areas & pushes it away from an area that was previously flooded with blood.